In the CurrentSee Application, individual device level energy profiles are built and logged over time. These profiles track the important parameters needed to ensure efficient use of electricity within operations like device level electricity costs, performance efficiency, and when devices are ON/OFF. For small businesses, this is the perfect low cost passive solution to energy use data and analytics. For companies with many different facilities over a broad area, this provides a centralized web interface to monitor and track every facility down to the device level in real time. Real time knowledge of when devices are ON/OFF allows for passive monitoring of operations with verifiable time stamps on device usage. This data stream increases accountability and can be used to coach employees on energy conservation and for an additional level of security or oversight. Each device energy profile contains a notification section where parameters can be customized. Settings can be adjusted to notify when a device is operational outside work hours, exceeds a preset amount of electricity over a time frame, or exceeds a preset cost. Notifications can be distributed as texts or emails to a single or multiple users. The device level energy profiles reveal patterns of energy consumption over time. As the devices ages and the internal components wear down, the pattern of energy consumption changes. CurrentSee is able to alert you to this slowly unfolding process early, before the wear and tear affects the performance of the device. Patterns also reveal when there is an impending failure and notifications are sent to the appropriate people so they can arrive on site prepared for the task at hand. Can the CurrentSee Energy Monitoring System detect all of my devices? Every device that consumes electricity does so in a distinct way that can be identified through analysis of the electrical signature. The larger the power consumption, the less data is required to determine the device with accuracy. 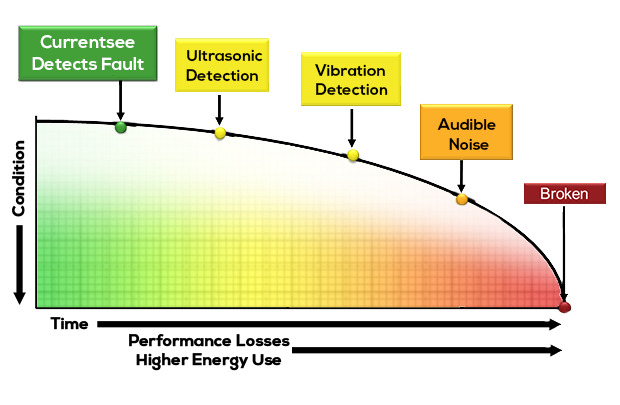 The lower the power consumption, the more data is required to determine the device with accuracy. Devices that consume very little power are difficult to detect upon installation. 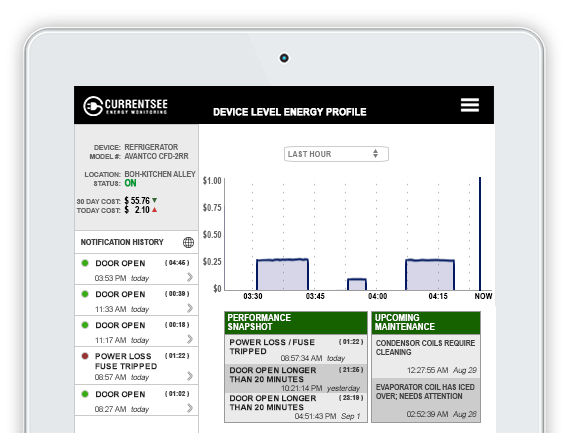 Over time, the CurrentSee Energy Monitoring System becomes more accurate and reliable with automatic detection. Is there a subscription fee for the app? There is no subscription fee to access the application and to begin tracking your power consumption. As our company grows, we will explore options based upon clear value propositions and feedback from the customer base. How much bandwidth does this consume daily? The CurrentSee Energy Monitoring System is highly efficient with data transfer and uses minimal bandwidth (~1 MB a day). Can this be installed in any electrical panel? The CurrentSee Clip are designed to be installed in main panels that house 240V power and less. Future Clips are being developed for higher voltages. Does the CurrentSee Clip measure Voltage? How much power does each CurrentSee Clip consume? The CurrentSee Clip uses less than 1 Watt of power to perform all of the tasks and report the data wirelessly. That is the equivalent to the amount of power used by a 60W lightbulb being turned on for 1 minute. Is this for a home or a business? The CurrentSee Energy Monitoring System is a universal low voltage solution that provides real time data on electrical energy flow through wires. The CurrentSee Clip is appropriate for any application that uses 300V power or less making it useful for both homes and businesses. We will be releasing a 500V solution in the near future. What happens if a surge enters the network? 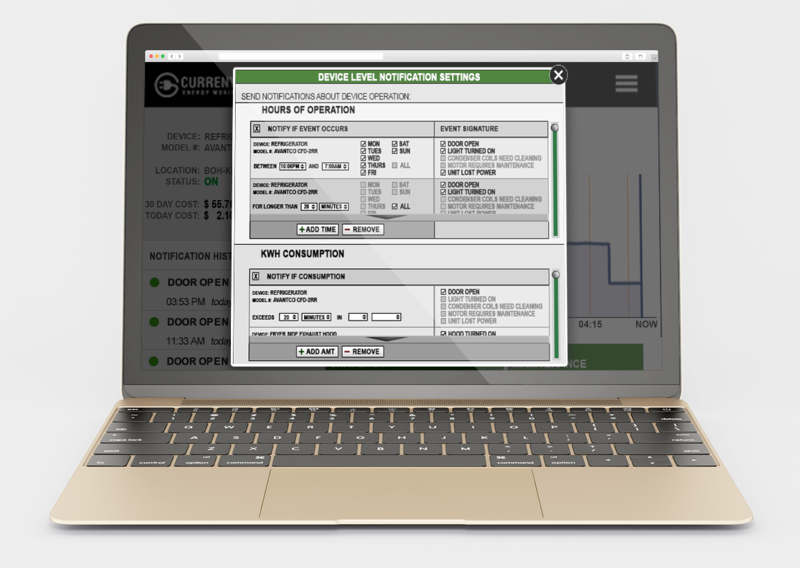 Surges do not affect the CurrentSee Energy Monitoring System, although they will be logged so the customer will be aware of the frequency of such events and have the information available to determine if any additional protection is required. No an electrician is not required, although we will add the caveat that if you feel uncomfortable removing the front face of the main panel and clipping this sensor around a live wire, then you should hire an electrician. The CurrentSee Clip was designed to be installed without ever disrupting the power in less than 5 minutes by an inexperienced person so the cost of the electrician will be minimal. Is this available outside the US? Yes. It is available for purchase online and can be used anywhere on earth as is without any modifications as long as there is a tiny amount of current running through the line and there is a viable wireless connection.